On April 10, 2009 five American soldiers were killed in combat in Mosul, Iraq. SFC Bryan E. Hall, of Elk Grove, is one of those soldiers whose heroic actions saved the lives of his fellow soldiers and Iraqi civilians. This walk honors Sergeant First Class Hall and the other four soldiers killed in the confrontation and all American Soldiers, past and present, who serve our country. All proceeds from the walk will be split between the Bryan E. Hall Memorial Scholarship Fund and an education fund established for SFC Hall's young daughter, Addison. 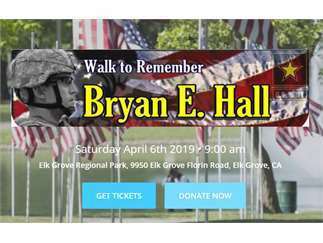 Please bring your family and join us on April 6, 2019 for a patriotic 5K (3.1 miles) walk in Elk Grove Regional Park. Check-in begins at 9:00 a.m. - refreshments will be served. The opening ceremony begins at 10:00 a.m. and concludes with a delicious lunch provided by the Elk Grove Lions Club. Advance registration is $25.00 per person; $75.00 for groups of four to six members; $100 for groups of 7-9 members; $150.00 for groups of 10. You must register online by April 3rd to receive the advanced registration discount. Cost: $25 per person. Discounts for groups.